To Implant or not to Implant? There is much contention on this topic centered around marketing and product consumption, but unfortunately, some of the points of view are based on bad or insufficient information. In my experience having been around both grassfed, non-implanted cattle and implanted feedlot animals, my opinion is based on the goal of the operation. There are many reasons to choose one side, the other, or somewhere in between; maybe its a niche or local market we try to reach, perhaps its based on our own ethics or standards. For whatever reason though, it really comes down to the producer’s final decision. Hormonal implants are placed in the back of the ear under the skin where there is no direct contact with edible portions of the carcass as mandated by federal law. Implants are made up of small beads that contain growth stimulant that is released over a period of time which is determined by the product used and the producers implanting plan. Growth stimulating products are used in approximately one-third of the nations cattle herds, and while they have been studied extensively and approved for use for over 50 years, many refuse to utilize implants or even consume products from implanted cattle. 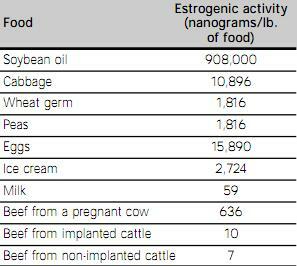 Many people do not realize how little if any of this hormonal increase is detectable in beef from implanted animals, and that the potential amount of estrogen consumed pales in comparison to the normal amount the human body produces on a daily basis. The reality of US beef production is that we are feeding the world essentially, so we also have to take other market’s desires into effect. Cattle and other agricultural commodities will be feeding an exponentially increasing population estimated to be over 9 billion people by 2050. Yet we don’t have an increasing land mass and ever tightening standards leave producers constantly finding new ways to increase gains and improve animal production. Due to these, and many other reasons, we lose agricultural lands every year as the number of farmers and ranchers declines. The EPA states “less than 1% (of the US population) claim farming as an occupation (and about 2% actually live on farms)” http://www.epa.gov/agriculture/ag101/demographics.html. There are many reasons people may have on either side of the implanting issue, but there are available options to purchase beef produced practically every way you can imagine to fit any lifestyle. I urge you to disregard rumors, stigmas, and others opinions; instead use the amazing resources available to every American today and spend a few minutes doing a little bit of research. There are many college and state extension web sites as well as federal guidelines that may not change any opinions, but can inform and educate the general public. I personally recommend starting at a site like: http://www.drugs.com/vet/ralgro-implants-for-beef-cattle.html. Drugs.com covers uses and effects of practically every drug used worldwide, and cattle implants are included. Hopefully this will serve to inform and clear up some common misconceptions associated with implanting beef cattle. Thanks for reading, and please feel free to leave some feedback on this topic! I was browsing the online classifieds one evening after another weekday at work and three college classes when I stumbled across a job for a ranch manager in Eastern Montana. “Look, at this! Wouldn’t that be awesome?” I exclaimed as I read the ad aloud. Every bit qualified, and always ready to run off and cowboy somewhere other than where I am at the present time, it sounded worthwhile to load our lives into the Ford pick-up and brave the icy northwest winter roads. Of course that’d mean dropping out of a semester of classes and leaving a job with a pending promotion in the dust, but it was MONTANA! Something about the Montana cattle country has called to me since my last deployment in the Middle East prior to leaving active duty a year and a half ago. I slept on it, mulled it over the next day and came to the realization (as I had last summer when I had the chance to run a pack string in the Idaho mountains) that no matter where you are or what you are doing, there is a pretty likely chance that somewhere, somehow, the grass will always be greener on the other side of the fence. Needless to say, since I just took a math test this past Wednesday and did get that promotion at work, that I am not writing this from the house included with the job as a ranch foreman. But I have been in this situation on a few occasions now and realize that it’s just life, and here in the real world, there are bills to pay, uncertain paths to future dreams and aspirations, and sometimes in order to get to where you want to be, you have to buckle down to the job at hand might not always get to do exactly what you want. That being said, once I started thinking about it, I am lucky enough to have a drama-free lifestyle, a job that I don’t hate that pays the bills and helps put food in the cupboards, and a comfortable place to call home. And that’s what it all comes down to, right? The nuts and bolts that build the foundation for a happy, rewarding life regardless of where you are, where your headed, or what title you may hold. Sometimes all we need to reflect on how good we really have it are moments like this.